The most effective way of drying plastic granules. Optimized design and nice figure. Hot wind extending device of high drying efficiency is achieved. Special bend design ensures hot wind coming in a smooth way. Convenient for routine maintenance. The hopper and the internal parts are made of stainless steel. As the hopper body is separable from the bottom part. It is quite convenient of hopper clearing and change to next material drying easily. Overheat protection device to prevent operator’s injury or mechanical breakdown. Main power source switch for safety purpose. Magnetic base and normal base with transparent window optional. Hopper dryers (hot air) are the most effective way of drying plastic materials. Drying directly at the machine throat eliminates the possibility of contamination or re-absorption of moisture when transporting from a central drying position to the machine hopper. All models offer rapid heating, 24-hour timer; 7-day timer and microprocessor controller which contains P.I.D. temperature control, digital setting, display of drying temperature, 99-hour timer for auto start-up and fault display functions for the option. Contacting parts on raw materials is made of stainless steel. Precisely cast aluminum shell.smooth surface and good performance of maintaining temperature setting. Curved eletric heating tube designed avoid buming caused by raw materials dust accumulation at the bottom of tank. Precisely temperature control by adopts digital (Proportional deviation) display temperature controller. Packaging Details: Wooden Pallet Packing Deliver through Trusted courier service. In Hopper Dryer Loaders are the simplest version of a ‘resin conveying system’ but they are not an integral part of a central conveying system. 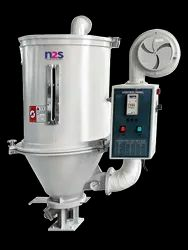 Self-contained vacuum loaders are used to transfer pellets , regrind and powders from a single source (usually a Gaylord) to a single destination (usually a blender, drying hopper or machine throat). A pickup lance is inserted into the material source container and a length of flexible hose connects the lance to the loader. n Hopper Dryer Loaders are the simplest version of a ‘resin conveying system’ but they are not an integral part of a central conveying system. 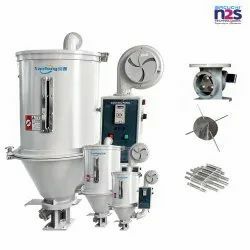 Self-contained vacuum loaders are used to transfer pellets , regrind and powders from a single source (usually a Gaylord) to a single destination (usually a blender, drying hopper or machine throat). A pickup lance is inserted into the material source container and a length of flexible hose connects the lance to the loader.